Chocolate Mint Snaps - Chocolate Chocolate and More! 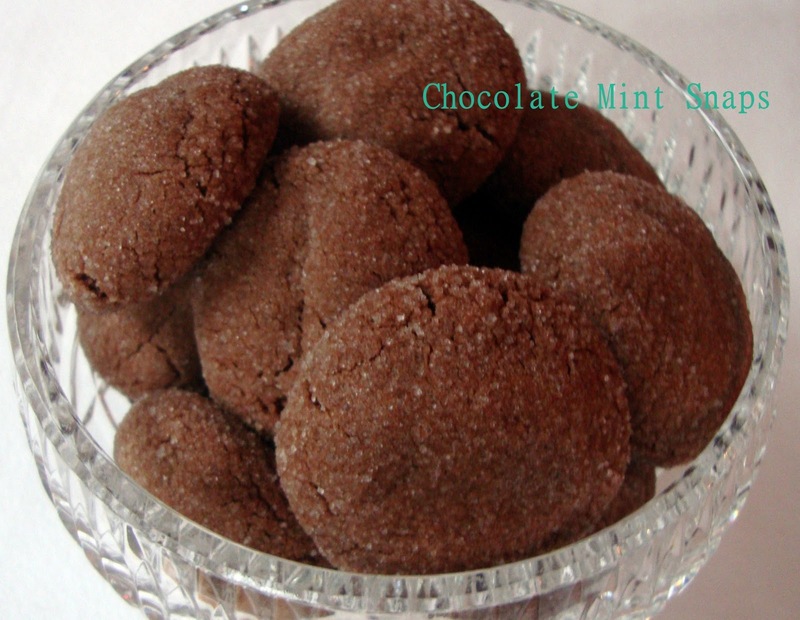 Chocolate Mint Snaps are a chocolaty, minty twist on gingersnaps. Easy to make and kids love them! And that if the recipe is worth it, I’ll write a post about it. Saving them the time of figuring out which recipes are the really good ones. So when my friend handed me a cookbook called Chocolate Fantasies, I didn’t even hesitate. Place chocolate squares in double boiler to melt. Set aside to cool. Cream shortening till smooth then gradually add sugar. Blend until combined well. Add cooled chocolate, eggs, corn syrup and flavorings. Mix well. Sift together flour, baking soda and salt then gradually add to chocolate mixture. Mix just until all blended together. Roll dough into 1 inch balls and then roll balls in granulated sugar. Place on cookie sheet and bake in preheated 350 degree oven for 10 minutes. The mint in these cookies is not overpowering, just a nice hint added to the chocolate flavor. The dough also freezes well so it can be made ahead of time then taken out and baked as needed. wow this looks great and I think it is easy to prepare too…I think my kids would love this, something new for a snack. My what an easy sounding recipe! It is definitely going to the top of my ‘must make’ list! Yum. And a cookbook called Chocolate Fantasy? I must go find it now. Sounds great! Susan, If I could have found it anywhere on the internet, I would have provided a link. It was published by Southern Living, original copyright 1987, last published in 2004 by Oxmoor House. Chocolate and mint is always a welcomed combination in my house. Those cookies sound fantastic. Hey girl, for some reason I followed you on facebook but not the blog. Feel free to slap me silly. I deserve it. These cookies look so good. Perfect combination with mint and chocolate. Little circles of heavenly goodness. These are so pretty!! Wish I could taste one!! Can’t believe that you don’t OWN a cookbook…or write one called Chocolate Fantasies!! 😉 Just sayin’!